It can be a long and confusing road for students to learn the Central Dogma of Molecular Biology (DNA begets RNA begets protein). Students have to grapple with specifics such as 5′ to 3′, DNA vs. RNA nucleotides, base pairing, triplets, coding vs. template strand, and using a translation chart. If you are not very specific with the questions you ask on assignments or exams, you can receive widely varied answers that are the reverse or complement of the “correct” answer. Figure depicting RandomORF Generator’s interface. Carr, et al. 2014. The idea is that students will see an oligomer of some number of base pairs and it is up to them to figure out which of the 6 possible reading frames is the one that will encode a protein. Each of the other 5 reading frames contains a stop codon. The same is true of researchers looking at novel nucleotide sequences. You would have to figure out which open reading frame (ORF) is the one with a biological function without multiple stop codons. Students can practice on their own using this website. After choosing an oligomer length, the webapp makes a nucleotide sequence. 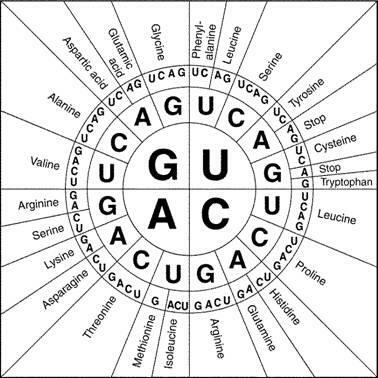 When the student is finished or needs some help, another click shows the 6 different reading frames and which one lacks any stop codons. The webapp could also be used to make assignment or exam questions. As a side note, I want to share my favorite protein translation codon chart (see below). Many charts are organized into a table, but I find this circular version much easier to handle. The first RNA nucleotide of the codon is in the innermost circle, the second nucleotide in the middle circle, and the last nucleotide (the wobble base) is in the outermost circle. With a little practice, students can pick this chart up pretty quickly. This entry was posted in Apps, Assignment. Bookmark the permalink.